Ok, that was a more valid run. ...and the ankle injury is back. Bugger. Well, I'm off in the morning for two weeks of hiking - Grand Canyon and Utah National parks. It will be interesting to see if I'm in better or worse running shape when I get back! My objective is to move from 3.1 miles at 7:30/mile to 5 miles at the same pace by the end of February. Had a terrible start to the New Year, generally and in running. Here's hoping things improve. I'm so out of shape that those 2 miles aren't consecutive. It took me 30 damn minutes to get that much (I'm only counting the miles I actually ran and not the ones walked/jogged). I just got back to uni this week and got some running in. I can't shake off the ankle injury. Sets in at around 4 miles and pulls with every step, then still hurts when I wake next day. I've booked into my local running shop to get my stride checked (which will probably result in me needing to buy new shoes I can't afford. I think I must have done ~1000 miles in my old shoes do I suspect they're shot). Any other ideas? Last edited by gaurwraith on Wed Jan 11, 2012 9:20 am UTC, edited 1 time in total. Started doing some shorter, faster runs with good results. Thanks. Sorry about the delay, I'm a bit buried in work at the moment (and I think my old avatars are on a MacBook with a broken screen) but I'll look it out when I get the chance. Ankle's holding up so far... I'll go out again later today when the work finally drives me fruit loop. Warm? Ha! -3 when I went out. (but still far better than half an hour flying kites with my children on a chalk ridge in the afternoon. I'm not a fan of wind- chill). Jumble wrote: Warm? Ha! -3 when I went out. So I decided I am gonna start running again. First day didn't go that well. I fell on a slippery patch on the last run, so I had to cut it short. Well. Thought I'd add this week's runs on. Backpacking trip left my knees in sorry shape (they held up well throughout the trip, but just feel so weak and unstable now after the fact, even after a week of downtime), and definitely took the edge off my cardio... so I guess I should be grateful that I only lost a few seconds on my time, for not having run in nearly a month. Also, what is it doing being 53 degrees on January 24th in New Hampshire? I know it's not much compared to the runners in this thread, but I started couch to 5k. This mile was my first under 12 minutes so I'm donating it to the thread. Webzter wrote: I know it's not much compared to the runners in this thread, but I started couch to 5k. This mile was my first under 12 minutes so I'm donating it to the thread. Eh, I've been contributing in 1-3 mile increments, and have so far tallied 51.85 miles, or just over half a percent towards the 10,000 goal. In that time, the forum as a whole has run 672.4 miles, meaning I'm accounting for approximately 7.7% of the current pace. If I keep it up, but don't improve at all, I'll have tallied around 465 miles by the time we reach the end, or approx. 4.6% of the final sum. So every little bit helps. We can't all match Themis' War on All Pavement*. *Since I'm adding up anyway, I couldn't help but check. Themis, you have accounted for 300.25 of the last 672.4 miles, or approx. 44.6%. So, although it's reasonably close, you are not currently outrunning the rest of the forum combined. Time to step it up! That's how I started too mate! Welcome! Got to 15.7 K without much trouble, almost at the front door, then my ITB flared up. Hobbled the last few hundred metres. Bugger bugger bugger bugger. Hey, I take the War on Pavement very seriously. 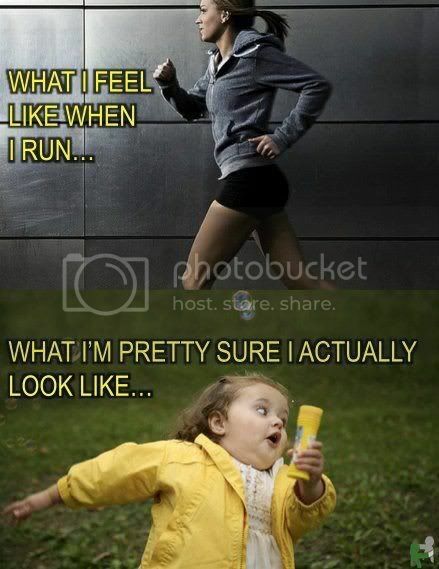 Oh, I *know* I look like the bottom photo when I run. I have evidence. And a beard, so at least that's different. Anyone else have this problem? Every organized run I do, when I see the official photos afterwards all the ones that should contain me running an epic half marathon with an expression of heroic determination, actually contain a picture of some comedy David Mitchel lookalike trying to do the funky chicken dance whilst suppressing a violent bowel movement. I think it's a conspiracy.